Speaking of heroes...Joseph Gordon-Levitt is supposed to be ours in this movie. I say "supposed to" because honestly, this just wasn't the role for him. He's a cute kid. Not amazing looking, but cute enough to overlook the fact that he was a part of both 3rd Rock from the Sun and Roseanne. He carried that cute-sy puppy dog face through 10 Things I Hate About You and into 500 Days of Summer, where he and Zooey Deschanel competed to see who could be more pathetically cute looking. It all changed when he was cast in Inception. Suddenly, he was sleek and adult looking in his three piece suit, part of this semi-criminal enterprise. But it was believable because A. he was wearing nice clothes, which is always distracting (just ask unattractive men who have money) and B. he didn't really have many lines in the movie. 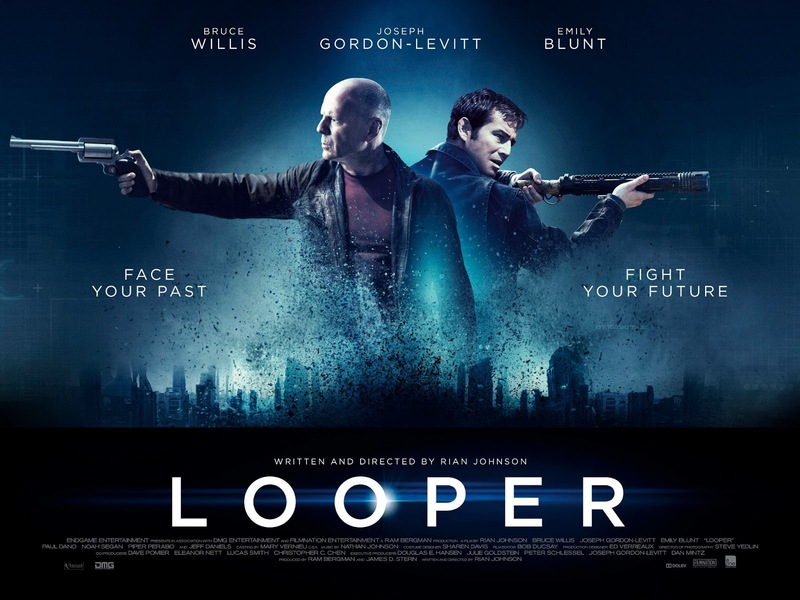 But in Looper, he's carrying the movie. Like, he has the majority of the dialogue, which is a problem. Because he can't really act. At least, he can't act like anything other than a cute, sad puppy dog. Look, I get that Hollywood is always looking for the next big action star. And sometimes they can create one out of someone you would never expect (see: Matt Damon as Jason Bourne). But pretty much the only thing Joseph Gordon-Levitt has going for him is his boyish looks, and he didn't have those in this movie. I don't know if it was the director's attempt at making him look older and "gritty", or if it's just him aging, but he looked so unattractive throughout this movie that several times I had to check the DVD cover just to make sure it was really him acting in this movie. It's not all Joseph Gordon-Levitt's fault, though. The real problem is the fact that the movie is based on time travel. 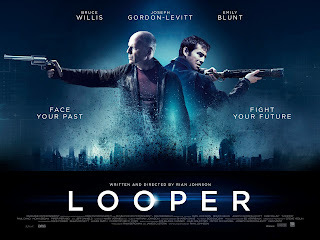 I understand the point of making a movie about time travel is to allow this narrative about changing the future, but writers seem to defy logic when the future is somehow going to affect the past, which is going to affect the future, which is happening the simultaneously with the past. You lost yet? Yeah. That's what happens when a movie tries too hard to be cool and interesting. I can't get too far into specifics without ruining the plot, but rest assured if you have an IQ above 80 and think about the particulars in the storyline, you'll realize it makes little sense. But hey, at least the end is exciting. Bruce Willis should never be asked to cry on screen. After a career in which he plays some of the most badass characters in recent cinematic history (aka John McClane), he shouldn't be subjected to a horribly awkward attempt to cry on command. And frankly, neither should we, the watching public. Piper Perabo is suddenly making a comeback, which is, well, weird, if only because I'm not sure I will ever see her as anything other than "that chick from Coyote Ugly." Which was 13 years ago. The best casting of the movie is the little kid, who is so freaking cute it makes you wonder how we ever had era of movies filled with those kids from The Sandlot and The Little Rascals. Final word: Bruce Willis just lost a little bit of credibility in my mind.